Although opinions vary about the value of crate training, a crate can be a useful tool when house training a young puppy, or even an adult dog. For dogs, a crate can be a place of sanctuary, a place of retreat from the busy home life. Some experts consider properly conducted crate training as imperative as appropriate healthcare, timely neutering, and obedience training. At the other end of the spectrum are folk who would no sooner confine a dog to a crate than lock their children in the laundry closet. Not all dogs respond the same way to crates. Some gravitate to them willingly; others detest them and will injure themselves in them while trying to escape. Why the difference? Nurture and developmental experience have a lot to do with the answer. Dogs forced to stay in crates, or other small confined places, under extreme adverse circumstances develop a “post-traumatic” association and will panic when confronted with similar confinement. On the other hand, a dog that has been well managed in a crate as a youngster may positively revel his crate as a place of security and comfort. Bad experiences in a crate include lengthy confinement for many hours at a time, infrequent attention during confinement, and absence of attachment figures. For dogs that have had unpleasant experiences in a crate, confinement may be viewed in the same light as prison to an ex-inmate – an experience to be avoided. Good experiences in a crate include circumstances that permit the crate to be viewed as a retreat or place of comfort, freedom to come and go (the door is left open periodically so that the dog is not always confined), company inside or outside the crate, and regular feeding and bathroom trips.For a dog that has been well acclimated, a crate can be a haven, a place of comfort, a retreat from the world…a den, in fact. Many dog owners think that, because dogs are den dwellers at heart, they will all automatically appreciate a crate. But real dens do not have doors. This is why care must be taken to encourage your dog to view his den as a retreat or sanctuary. For the owner, careful crate training can help to deal with housebreaking. Most dogs respect the sanctity of den, and their nature directs them against soiling the nest area. Thus, a crate can be used to confine a dog between unsuccessful excursions to a selected outside “bathroom” area. Make sure that no one disturbs the pup when he is inside the crate so the crate comes to be appreciated as a place of refugeUsing the above protocol, there is no reason that the dog should not gravitate toward the crate for rest and relaxation. If this is achieved, the dog will find the crate amongst his favorite places in life. Unfortunately, because of bad experiences, many dogs grow up loathing their crate with a vengeance, acting out in one way or another whenever they are confined. The following is a program by which older dogs can be introduced or even reintroduced to crates as a place of refuge. The goal is to systematically desensitize the dog by making the crate appear as benign as possible. If things go well with the acclimation, the next thing is to try closing and fastening the door for brief periods, while staying in the area. Do not leave the dog alone in the crate while you are away until he is perfectly comfortable being in it while you are thereThe program may take time but it will work. Note: With any behavioral modification scheme, like crate training, the golden rule is that if there is no progress in 3 to 5 days, change the strategy. It is important to emphasize throughout training and beyond that the crate should never be a place in which the dog has any negative experiences. In general, dominant dogs resist anything that they don’t like and will protect anything that they enjoy. If you try to force a dominant dog into a crate against his will, you have a pretty good idea of how he will respond. You might get such a dog into the crate eventually, but only with much growling, snapping, or even attempts to bite. Conversely, a dominant dog that views his crate as his own personal space may take the opposite tack and begin space guarding, i.e. growling at people who approach the crate or attempt to remove him. For some dogs with separation anxiety, the crate can be a place of refuge from their woes. They may be much happier inside a crate when their owner is away than when wandering free. For others, crates are an imposition, a misery, and an obstacle to be overcome at the expense of broken teeth and fractured claws. Owners return home to find these dogs bug-eyed, in a frenzy, and salivating profusely, and may even come home to find the crate splattered with urine, feces, and/or blood. For such dogs, the use of a crate is not a good approach, at least, not without a lot of retraining. Then there is the third group of crate-astrophes, the compulsive dogs. These dogs may have already suffered boredom and inadequate stimulation as a result of long hours of confinement. Such dogs, depending on their individual predilections will, variously, lick themselves, spin in circles, chase their own tails, or pace mindlessly. And crates may precipitate such behavior. Crates are usually contraindicated for dogs with such conditions. Crates are good tools for some dogs, some of the time. But, even when the crate works well for a dog, it is unwise to confine the dog for more than 4 to 6 hours a day to avoid having the crate becoming associated with negative experiences. Every dog should have an open door crate to go in if they so desire: A place to go when things get hectic, just for a little peace. Used in this way, a crate can be as much appreciated by the dog as having a room of their own room is appreciated by teenagers. And it is possible, once the dog enjoys the crate to close the door on occasion. But remember, confinement is for the convenience of the owners, not the dog’s, and should be employed sparingly. Dog Obedience Training Philosophies: Which is Best for Your Dog? Obedience training is basically an education in good manners. And, just as it’s more pleasant to be around well-mannered people, so a well-behaved dog is more warmly welcomed than his overactive, aggressive canine cousin. In fact, obedience training is critical in nurturing the most positive aspects of human-animal relationship. Its basic elements – sit, down, stay, come and heel – help shape a good canine citizen. Obedience-trained dogs have an easier life than their untrained peers. If they resist jumping up on strangers, sit or lie quietly when asked, and walk politely on lead, they’re bound to spend more time with their owners going to picnics, ballparks and dinner parties. So, instead of thinking of a training program as a series of empty rituals, think of an education that will assist your dog coping in the real world. If you’re inexperienced with training, consider enrolling your dog in a formal class (puppies can join “kindergartens” or pre-novice classes). Most basic obedience classes – typically at the “novice” or “pre-novice” level – include the basic exercises: “sit,” “down,” “stay,” “come” and “heel.” Each plays an important role in day-to-day communication between people and their dogs – improving pups’ manners even and their safety. An experienced instructor can help guide you through issues, such as the timing of rewards when your dog “listens” and the best way to respond when he doesn’t listen. Even your facial expressions or body posture can affect your dog’s performance – subtle influences that you may not be able to detect without the help of a trainer. In some classes, time is also devoted to exercises and behaviors such as: jumping up, dropping objects on command, and controlled walking (without a formal “heel”). There may be socialization exercises and short lectures on relevant topics in addition to the training. An interesting evolution in thinking often occurs when people join training classes. Though they may have signed up for just one class – typically eight weeks of training – they enjoy the experience so much that they often re-enroll for the next level of training, and then the next. To teach your dog anything new, the successfully completed task must result in some kind of reward. It’s unrealistic to imagine that your dog will perform a task simply because it pleases you – though some do seem particularly keen to satisfy their owners. But petting a dog may not be enough for some critters, especially for those excited dogs who would rather cavort than be petted by you, their momentary obstacle. In order to convince your dog that training exercises are fun, consider what he’ll work hardest for. For many dogs, the most compelling reward is a small piece of delicious food, such as breakfast cereal or freeze-dried liver. Others work for petting or praise. 1. Training a dog should be an enjoyable experience for you and your dog. If you are not in the right mood for training, don’t even start. Keep training sessions short, on the order of 5-10 minutes, to maintain your dog’s motivation. 3. Training your dog should not involve any negative or punishment-based components. There should be no yelling, no hitting, no chain jerking, no hanging, and absolutely no electric shock. Each session should be upbeat and positive with rewards for jobs well done. 10. Gradually increase the length of time the dog must remain in a SIT-STAYuntil he can remain relaxed in this position for one minute while the owner is at a distance of 5 feet. Continue to increase the time and distance the dog is asked to remain in a SIT-STAY after the dog has been successful at the previous level for 5-10 trials. And remember, regarding basic dog training, “Art and science aren’t enough; Patience is the basic stuff.” (Konrad Lorenz). You’re standing in the pet store and there they are row after row of crates, just big enough for a dog. They’re made of fiberglass or plastic or just plain open wire. For all their differences, they evoke just one thought: Jail. Not so fast. Despite their appearance, crates can be a boon for a puppy – a home-away-from-home or a comfortable retreat for when the rest of the family gets to be too much. Also, crates are great tools for housetraining because dogs don’t like to soil their immediate environment. In addition, for car travel, inside a crate is probably the safest place for a puppy to ride, and, for pups that have to fly cargo, crates provide a touch of the familiar on the plane. First, make sure you don’t isolate your pup when he’s in his crate. Buy two crates, and put one in your bedroom – so he can sleep beside you at night – and the other in a busier part of the house for daytime use. Line the crate with a soft blanket, put in some small treats, and then show the puppy how to get in. Once your puppy has figured out how to go in and out of his crate, and has satisfied his curiosity about it, use a cue word – such as “kennel,” as he moves toward the crate, and hand him a treat as soon as he enters. Repeat this several times at random intervals until he goes in when he’s told to. At this point, you can shut the door for short periods, without making a big fuss about it. In fact, it’s best to ignore your pup while opening or shutting the door. Once your puppy is willing to rest in the crate, start confining him for varying periods of time, and at different times of the day, while you’re at home. The more random and persistent you are, the less the dog will worry when you do have to leave the house. With this kind of routine, your puppy will learn to rest while crated, and that’s exactly the way you want him to feel – at home, relaxed and comfortable in his own little den. Occasionally you may want your pup to be in his crate when he wants to be out. Don’t try to fool him, by calling him to you and then forcing him into the crate. Instead, use a command like: “Go to your crate,” and lure him in with a little food. Hand over the treat as soon as he settles down inside the crate, and praise him and keep feeding him while he’s inside. The minute he ventures out, turn off the food supply – and the charm. Put a few pieces of kibble in the crate so the pup will develop the habit of going into the crate by himself, earning more praise and even more treats. Sooner or later, he’ll learn that he gets lots of attention, affection and goodies inside the crate – and very little in the way of treats outside the crate. By the way, never put your pup in his crate for misbehavior “time-outs”/punishment. Using a crate in this way will render it aversive and therefore less useful as a behavioral management tool. Basically, house-training a dog is solving a spatial problem: You want to teach the dog to eliminate only in one place – outdoors. During the training period, it’s up to you to set limits. For example, if you don’t allow your pup free access to the living room and bedrooms, he can’t make a mess on the carpets there. Because most puppies can’t control their urine and feces for extended periods, the most important part of any house-training program is setting up and sticking with a schedule that your puppy can maintain. Feed him at consistent times of the day and watch his natural schedule: Puppies usually need to eliminate shortly after waking up, after eating, and after playing. Young puppies may need to urinate every four hours. If your pup repeatedly messes inside his crate, take him to your vet to rule out medical problems, such as intestinal parasites and urinary-tract diseases. 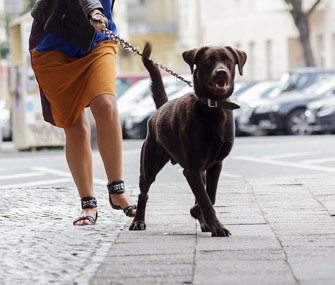 If you need to be away from home for a few hours, hire a dog walker to take the puppy out, or enclose your pup in a large pen to provide him with an opportunity to eliminate away from his resting spot. Leave newspaper or training pads down in one area when you are gone – but pick them up once when you’re home. Punishment after the fact doesn’t work. If an “accident” happens, clean it up with a good enzymatic cleaner and blame yourself: You’re the one who wasn’t supervising the pup at the time the “accident” occurred. If you catch your dog in the act of eliminating indoors, make a loud noise to distract him, and then take him outside right away. Dogs with separation anxiety will often urinate, defecate, or bark when confined. In fact, some dogs become so anxious when confined that they destroy their crates and hurt themselves in the process. These dogs may do better when confined in a larger area, but if the problem still persists, see your vet or check with a veterinary behaviorist. Crates come in different styles and sizes. Prices range from about $75 to $175. A comfortable crate should be about twice the size of your pup. The most common types are the pressed fiberglass models favored by airlines and the open-wire cages that are available at most pet stores. Fiberglass kennels are the most sturdy and the safest for traveling in a car or airplane. Decide before you give the command what you are going to reward. You can also start to reward longer and more definite SITS so the dog has to do more than just touch his rear end on the ground to receive reward. Withhold the foodtreat until the dog is sitting properly and then gradually introduce a time delay before the reward is given. For centuries, dogs have been valued for their roles of alarm-sounder and guardian, as well as for their hunting and herding skills. But owners do view all behaviors that their dogs engage as desirable. Sometimes dogs are aggressive, or urinate or defecate in inappropriate places; and sometimes they bark when it is not called for or steal things from the countertops. Long before the days of behavioral psychology, dog owners intuitively knew that rewarding a desired behavior and punishing an unwanted one would eventually encourage a dog to conform more closely to its owner’s wishes and expectations. Those simple tenets now constitute the basic premise underlying any form of dog training. Some people seem to possess a natural affinity for training. Perhaps because of some innate gift of timing (of reward and punishment), perhaps through tone of voice or body language, or perhaps through some uncanny ability to know what the dog is thinking, these individuals can train a dog faster and better than most regular mortals. Trainers, whose unique abilities transcend species, are themselves a breed apart. There are two completely different schools of thought for training dogs. One is referred to as “gentlemen’s training” and the other as “ladies training”; both are “canine training”. In the past, for gentlemen wishing to train sporting dogs, the approach was more physical and coercive, entailing a significant amount of correction (punishment) for commands not followed. Punishment, though interspersed with praise, was nevertheless instrumental in the technique. Ladies training, however, presumably for lap dogs and other purely companion dogs, entailed none of such brutish behavior and was based almost exclusively on what is now known as positive reinforcement (that is, reward-based training). During World War II, with the need to train service dogs a high priority, the U.S. Army co-opted military-style trainers (of the coercive variety) to train the dogs of war. The training used, while effective, was not for the faint-hearted and caused irreparable damage to some of the dogs. Postwar, these trainers became dispersed among the community, teaching owners to train their dogs using the only methods they knew, as they schooled another generation of same-style trainers. Though softened for the general public, coercive training, based upon dominating the dog physically by means of timely jerks or “corrections” applied to the dog’s collar, became accepted as “the norm” of dog training for the next 40 years or so. While all this was going on “ladies training” was slowly simmering on the back burner, employed by only very few trainers. In fact, this reward-based or “positive” training was slandered by choke chain aficionados who failed to appreciate reward-based training as anything other than a starting step. Referring to positive training as food training (which it largely was), conventional trainers dismissed its effectiveness, saying that dogs so trained would only respond while the owner was offering food. This is untrue, but the mantra became widely accepted and training dogs with food treats and other rewards was largely restricted to the training of very young puppies. Positive training methods never really did take off until “Click & Treat Training” found its way onto the scene. Click-and-treat training is not new. Discovered many years ago by psychologists, Breland and Breland, “clicker training” faded into obscurity for the best part of a century before being rediscovered by dolphin trainers who, for underwater acoustic reasons, often used a whistle rather than a clicker. As anyone who has been to a dolphin show will know, the tasks that dolphins perform during shows are complex, and they are executed with a high degree of accuracy. Look around the next time you go to such a show and you will not see a choke chain in sight. That a task has been completed successfully is signaled by means of a whistle, (“secondary reinforcer”) and then the real reward, a piece of fish, can be delivered a short while later. The dolphin knows from the sound of the whistle that it has performed the task correctly and will return to the trainer to receive his reward. Click and treat training radiated from dolphins to zoo animals and finally, through the work of a handful of pioneer trainers, to dogs. The reinvention of clicker training has revolutionized current dog training methods and is the training technique of choice for many dog trainers and dog training associations today. The beauty of clicker training is that it is fun for both the owner and the dog, and is eminently acceptable to owners. To make positive reinforcement techniques, including clicker training, more reliably effective, neither the click nor the real reward is necessary every time the dog succeeds. Rather these rewards can eventually be supplied on an intermittent basis, which makes the dog will work even harder to earn the reward. While the struggle for supremacy between coercive trainers and “total positive” (reward-based) trainers continues, with the latter group slowly gaining momentum, a separate controversy has emerged. That of trainingversus clinical behaviorism. Training involves training a dog to respond to audible commands and hand signals. It is, for a dog, like going to school to learn language, in this case, English as a second language, and obedience. Behaviorism, however, is based on fundamental psychological research and the study of dogs in the wild (ethology). It involves something more than training and is akin to human psychological counseling. Behaviorists attempt to understand a dog’s unwanted behavior, recognizing atypical or aberrant behavior, and employing techniques ranging from environmental modification and programmatic shaping of behavior to address behavior problems. In addition, veterinary behaviorists address underlying medical concerns and may prescribe mood and behavior-modifying drugs. Trainers and behaviorists rely on principles and techniques that cross each others’ domains, but there are fundamental differences, too. While trainers may make good teachers and family counselors, behaviorists are best suited to unraveling complex problems and modifying unwanted behavior. Even if no behavior problems existed, training would still be necessary. Dogs, like children, need to learn how to behave in human society in order to be socially acceptable. To have dogs running rampant is unacceptable, and proper training is what is required to teach the dog acceptable alternative behaviors. Acquiring the right interspecies communication skills is an important part of training and is necessary to secure the rudiments of an appropriate human-animal bond. Most of the problems in dogs are the result of poor training. The trainer’s function is to provide such instruction to assist in the healthy behavioral development of pups and juvenile dogs and to teach owners how to train their older dogs to perform new behaviors. (And yes, you can teach an old dog new tricks). If every dog was genetically sound and his owners followed through with the instructions of a knowledgeable trainer, there would be no behavior problems to plague us, but unfortunately this utopian situation does not exist. Instead, dogs are too often bred for the wrong reasons, acquired for the wrong reasons, are raised inappropriately and are untrained. Despite a few hundred years of selective breeding of dogs and at least a hundred years of “modern” dog training, the leading cause of death in dogs is still behavior problems that owners erroneously believe to be irresolvable. To be a little more specific, the number of dogs dying as a result of behavior problems is approximately three times the number that die from cancer, and half the dogs in the United States do not see their second birthday for the behavioral reasons. Fortunately the American Veterinary Medical Association has seen fit to accredit a college of Veterinary Behaviorists. This new college will provide board certified veterinary experts to help train the veterinarians of the future and, through continuing education, to educate the ones of the present. This should help ease the problem considerably. Also, the Animal behavior Society of the United States now certifies Applied Animal Behaviorists, all members having a further (research) degree, and many of whom pitch in to help deal with this major league problem. Behaviorists spend most of their working time trying to resolve behavior problems in dogs using a Sherlock Holmes-like approach. It requires taking a detailed history, making a diagnosis of the problem, and establishing whether the behavior is a normal behavior or a truly abnormal behavior. The behaviorist then employs all measures likely to help resolve the problem for the owner and the dog. Fortunately, in many cases, many of the formerly unmanageable problems are now resolvable, though different problems respond somewhat differently to the various therapeutic interventions. Dog trainers may snipe at behaviorists as being a white-coated brigade who sit behind desks and do a lot of talking, handing out instruction pamphlets without actually touching the dog, and behaviorists may look down on trainers as less well educated, poorly grounded counterparts. The fact is that both groups need to work together to resolve the multitudinous problems facing today’s pets and their owners. Rather than a territorial approach, it would be more effective for the groups to work together towards a common goal of improving the lot of pet animals and strengthening the human-companion animal bond. To use an analogy of the human medical system, which has in its ranks the family counselors, the psychologists, and the psychiatrists. Family counselors address domestic problems and train us to communicate and live together harmoniously. The canine therapy equivalent could be the dog trainers. Psychologists advise us when we have seriously detrimental behaviors that are self-destructive or problematic for others. The equivalent here would be the certified applied animal behaviorists. Finally, in human behavioral management, there are the psychiatrists, who deal with chemical imbalance situations and medically related behavior problems that may require medication. The only group qualified to intervene at this level, regarding canine behavior problems, are the veterinary behaviorists. All puppies need to be trained otherwise there will be behavior problems for the owners, at least. All the behavior problems need to be and can usually be addressed by either a trainer, certified applied animal behaviorist, or veterinary behaviorist, depending on the level of the disturbance. Hopefully, these latter expert groups will combine their forces and refer one to another, to solve the massive problem now facing the pet dog population and the many devoted dog owners.